Thank you all for joining in the Scandinavian Christmas fun! I wish you a very Merry Christmas and happy New Year! Today my sweet hubs will be sharing with us! Pepparkakor, or Swedish gingerbread cookies, are an important part of the Christmas feast in Sweden. They’re crisp, ginger-y, and altogether delicious, with a spicy kick. These tiny wafer-thin bundles of amazingness have made their mark over centuries of Swedish history. The first pepparkakor in Sweden is said to have been bake by nuns in Vadsten, a convent in Sweden. What we enjoy today as treats were prescribed as medicine for various ailments. Around 1500, the Swedish-Norwegian-Danish King Hans ruled his kingdom with an apparently not-so-gentle demeanor. Apparently, he was aware of his ill-humor, and directed his doctor to give him substantial doses of pepparkakor to cure his bad temper. The first time I had pepparkakor was when I was visiting my future wife’s family in Michigan at Christmas for the first time. At that time, I was lacking in experience in all things Swedish. I sat down for my first smorgasbord, an expansive, delectable feast for the eyes and the senses, with everything from pickled herring, meatballs, rice pudding, korv, and various desserts, including pepparkakor. I hadn’t even proposed to Kathryn yet, but I remember feeling really welcomed into the family that Christmas. And now that we’re married, every year around this time, I love eating pepparkakor with Kathryn and our family. It reminds me of that first time. To make pepparkakor, heat the brown sugar, white sugar, corn syrup and water in a pot. Add the butter and let it melt. 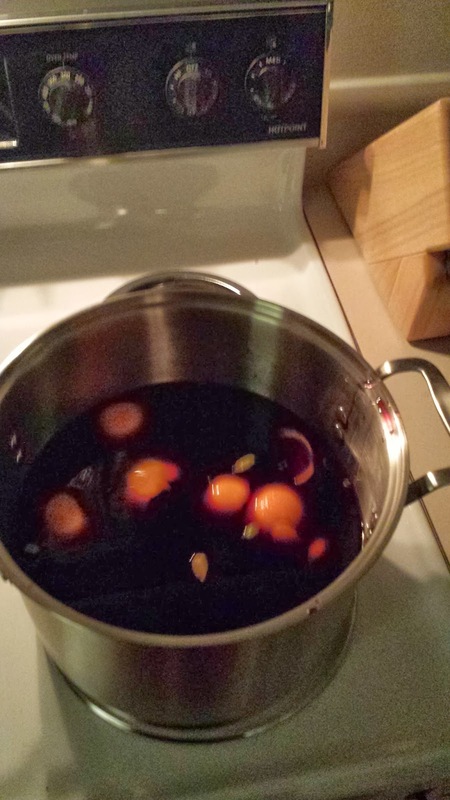 Stir and let cool slightly, then blend in the spices and baking soda. Then mix in the flour to a smooth consistency. Sprinkle a little flour on top and put the dough out to cool, preferably overnight. Take the dough and knead it smooth on a baking table, adding more flour if desired. Roll it thin and cut into shapes, using the desired cookie cutters. Bake in the oven (180°C/350°F) for 8–10 minutes. Let the pepparkakor cool on the baking sheet. Thanks, Ryan for sharing your love of pepparkakor! God Jul to all! Day 9! 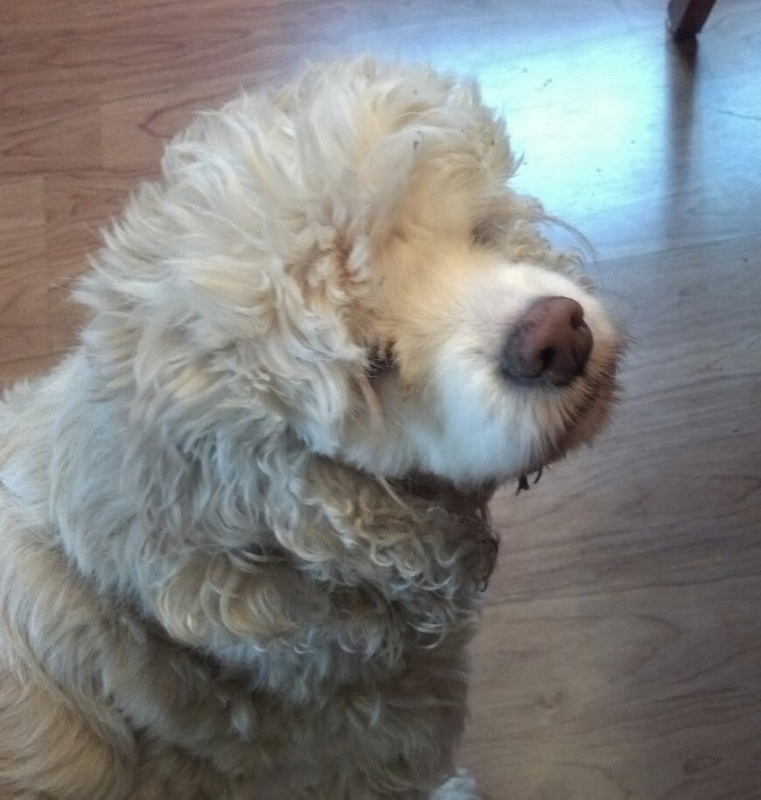 Today you are all in for a treat, my best friend Jessica is sharing today! Jessica is actually the one who introduced me to the art of sewing! Not only can this girl sew, knit, bake, and cook, but she has even been known to do a metal art project or two! She is seriously talented and I'm so glad that we're friends. And I'm counting down the days until I can see her in real life again (only 5 more days!!). I'm thrilled she is participating this year and I know you'll enjoy her adorable, crafty tutorial! Hello! My name is Jessica, and I am so pleased to be doing a guest post on The Pickled Herring! 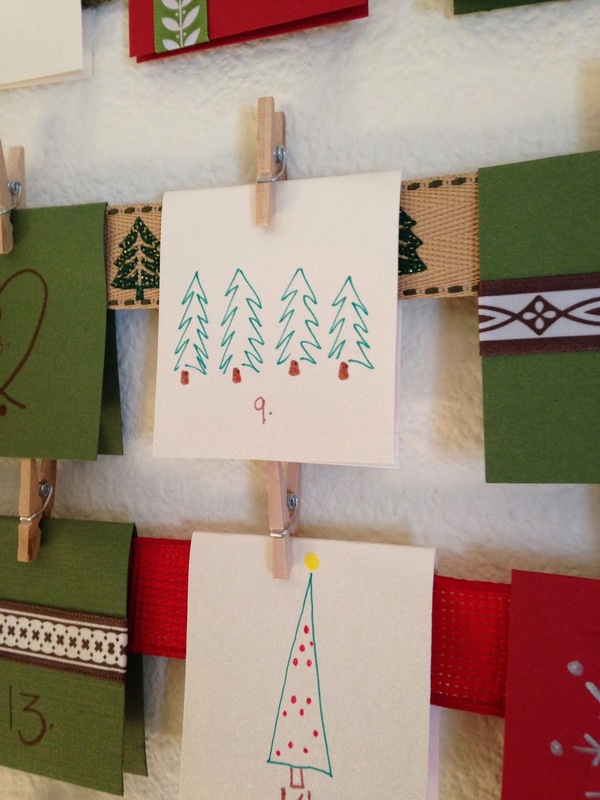 I love the Scandinavian Christmas series that Kathryn does, and am honored to be a part of it this year! A little bit about myself: I am Kathryn's BFF!! We have been pals since our time in the womb! Our mothers are friends, and we have been besties since birth. We were even called Siamese twins by one of our grade school teachers. My family celebrates our Swedish heritage every Christmas by having a Smorgasbord at Christmastime. We bust out the herring, rice pudding, and korv. We even have one of the girls dress up as Lucia and serve cookies. Kathryn is coming home to Michigan for Christmas (yay!!!) and we love to fika. So I decided to make Christmas Cozys! I'm so excited for her to see my new house and my new baby, and to catch up over a cozy cup of coffee! I have actually been working on one of those felt embroidered stockings, kind of like this, and it inspired me to add a little pizzazz with sequins. So what I did first was make a template. Use a piece of paper for this. 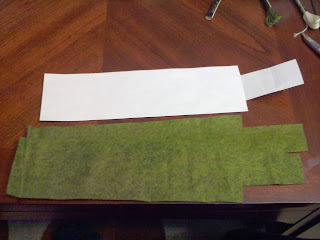 Once you have the template made, cut out 2 of those guys from the green felt. Next, you are going to make the Scandinavian heart. 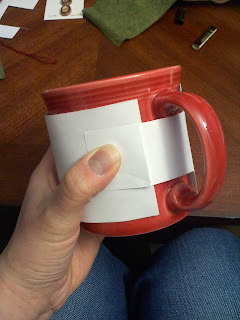 To do this, you take a square and add a semicircle to one side. 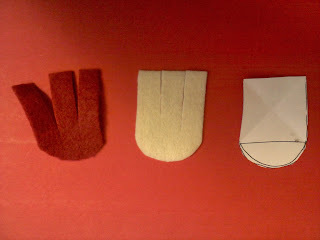 Then cut out a white one, and a red one of these. Then cut the square part into thirds. 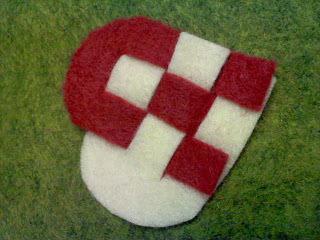 Then you basically weave the strips of felt to make a cute little heart! Embroider the heart onto one of the green felt pieces, adding some stuffing beneath the heart to give it some dimension. 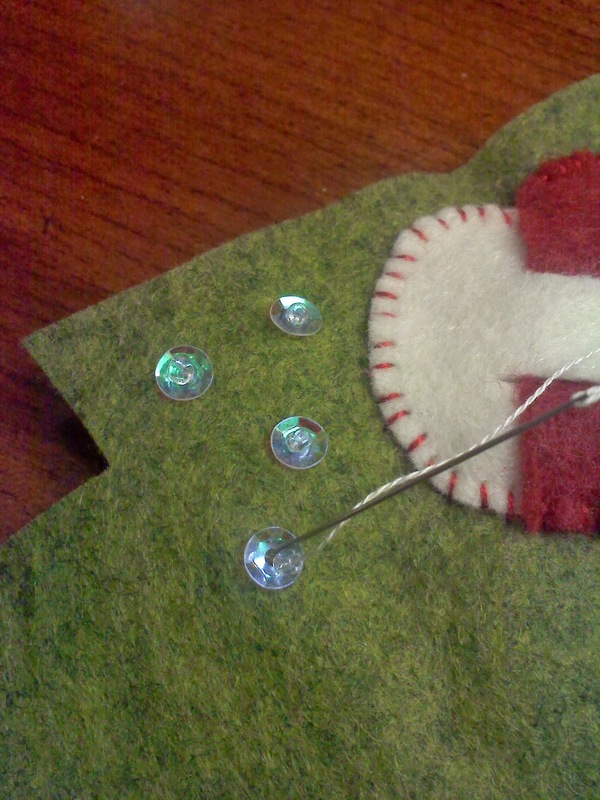 Then add some sequins by tacking them on with seed beads. Next, place the other green felt piece behind the one you've just embroidered, and use a running stitch and the white floss, embroider around the edges. After you've done this, you can clean up the edges by cutting away the excess (I suppose you could avoid this step by making sure the green pieces are exactly the same size, but I'm no perfectionist). 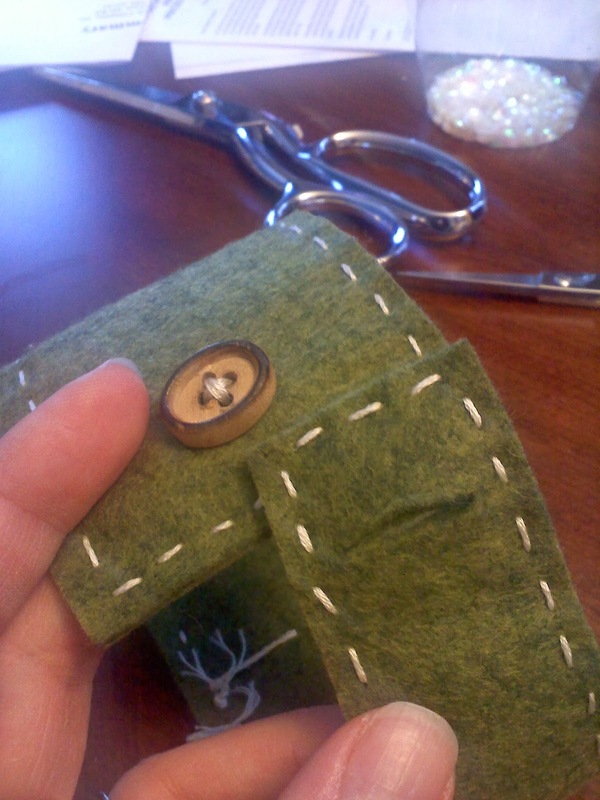 Then all you have to do is add a cute little button and cut a buttonhole! 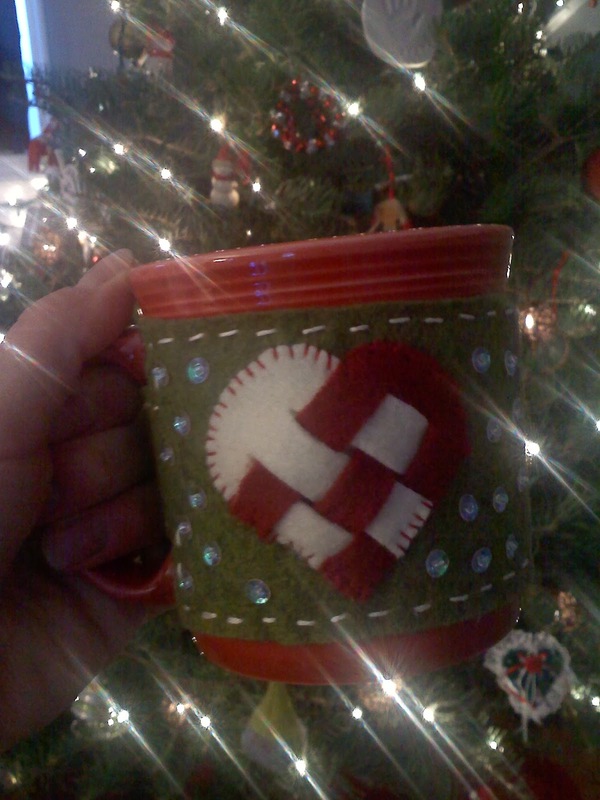 And here is your Christmas Cozy! Now, just make sure you have 2 for when your best friend comes home for Christmas!! 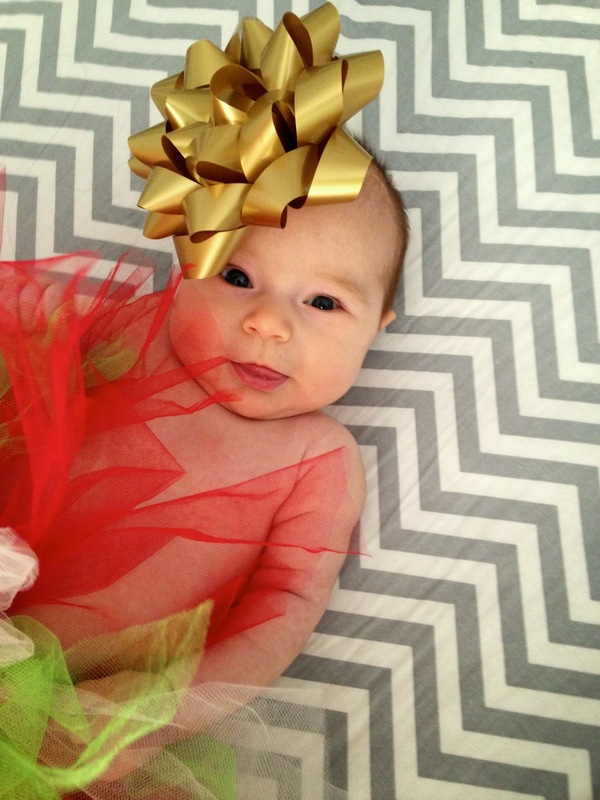 Oh, and here's my Christmas baby! Thank you, Jessica!!! I can't wait to fika it up with you in just a few short days! Come back tomorrow to hear from another good friend, Kate! Welcome to Day 8! Today I'm so excited that my sister, Caryn, is joining in the Scandinavian Christmas fun this year! I'm so thankful that Caryn and I live close enough to hang out and craft together - we've had a lot of fun craft days this year! 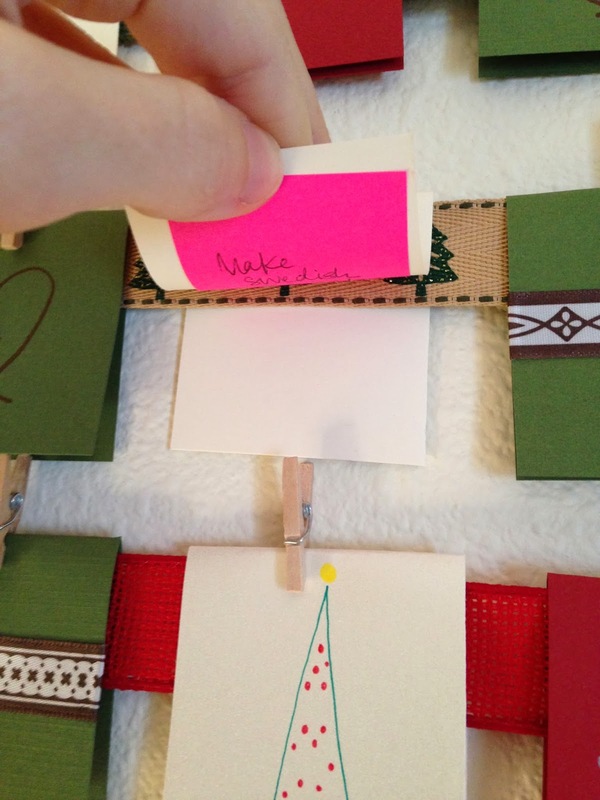 Today she will be sharing our year-long advent calendar project that we finished just in the nick of time for Christmas! Hi everyone! I am Kathryn’s sister, Caryn, who you might have seen on a few previous blog posts throughout this year. I am mostly Swedish with some Norwegian and a smattering of English and French…but my Swedish heritage wins out! I am a busy mom of two little ones, but in an effort to keep my sanity, I try to get together with Kathryn once a month and work on a Swedish themed craft. 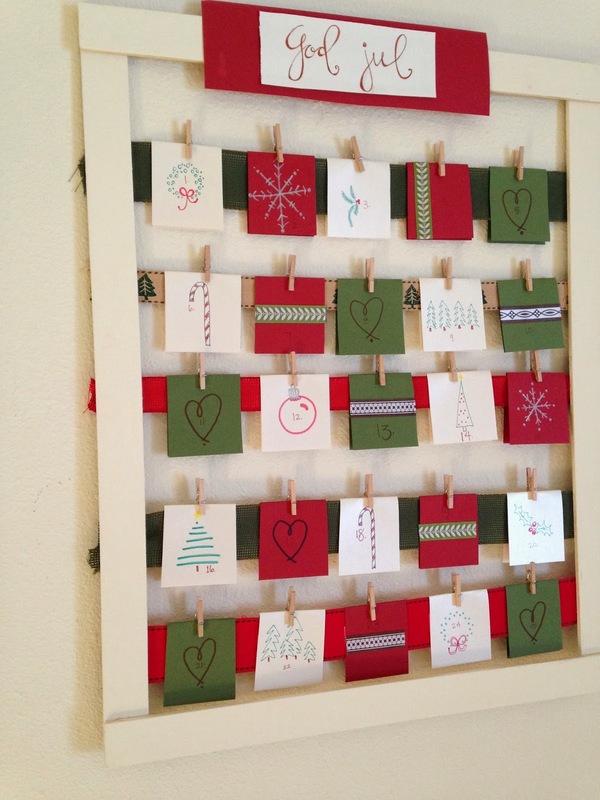 I have fond memories as a kid of my mom each year hanging up an Advent calendar that held miniature candy canes. It was always one of those decorations I couldn’t wait to see hung in its usual place on the wall, and while my three sisters and I would have to wait until our “assigned” day to eat our candy cane, it was always fun to watch the candy canes disappear, the days ticking by, getting closer and closer to Christmas. 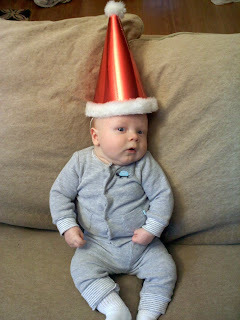 Last Christmas was my first Christmas with two kids—Hannah was just three months and Noah two years old. And while they were still a little young to eat candy canes, I found myself wishing I had an Advent calendar to hang up. 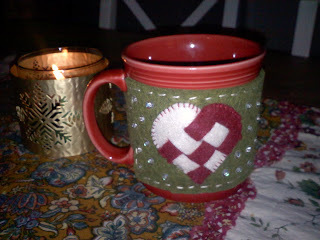 Hence the one-Saturday-per-month crafting days began. We began by researching calendar layouts and patterns…and drinking lots of coffee. 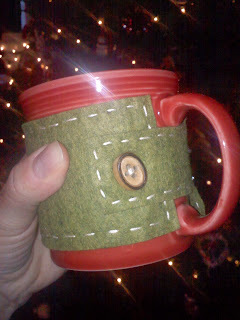 We decided we wanted to do something Scandinavian looking (obviously), with little pockets to hold candy canes. We also decided coffee was essential to our success. Next came time to buy our fabric. This took a few “sessions” to figure out because we wanted to pick out a few different patterned fabrics that all had similar shades of red. This was a little more difficult to do at some of the more commercial fabric stores, so we took a trip down to the fabric district in downtown LA. Success! We found multiple different fabrics that we loved and couldn’t wait to start. We began by cutting, ironing, and hemming the pockets that we were going to sew onto our linen background. 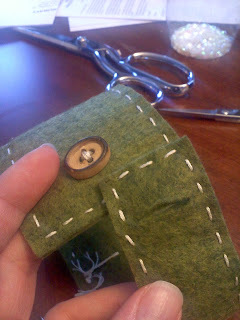 This is when I received my first lesson on using the sewing machine! It was so much fun! 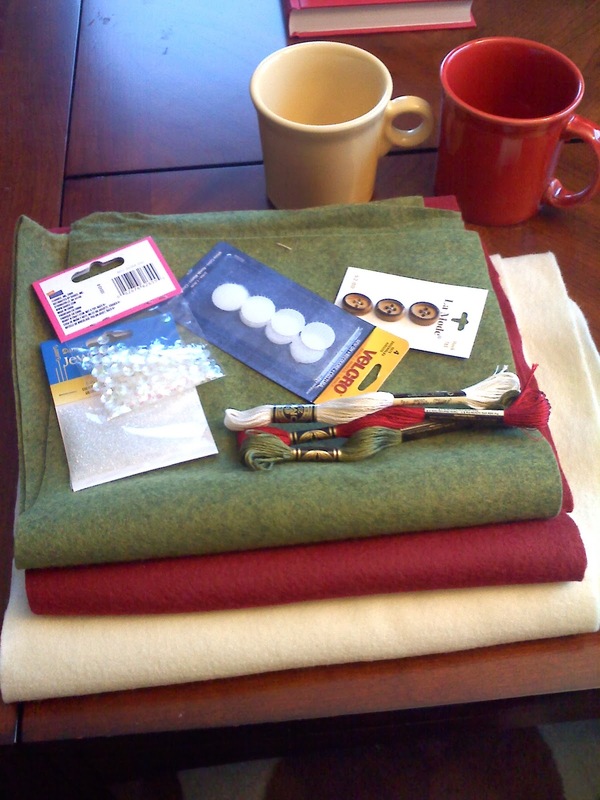 And yes, I will admit there was some truth to Kathryn’s previous blogging—I did talk to myself while sewing…and in my learning and experimentation I did do a “free willy” move or two. :-) Kathryn was a great teacher, and she bailed me out on a number of occasions when I got in a jam. It was so much fun to be able to start visualizing the calendar taking shape at this point. So glad Caryn and I completed our calenders in time! I had such a fun time working on it throughout the year and I can't wait for our 2014 project! Come back tomorrow to hear from my bestie, Jessica! Today we get to hear from KJ who blogs over at the super creative and fun blog Let's Go Fly A Kite! 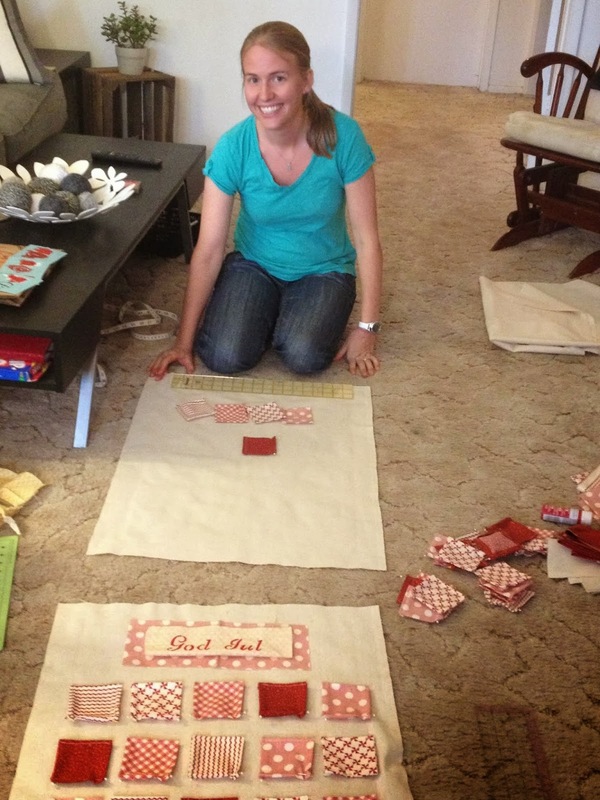 KJ has an entire section on her blog with fun craft projects to do with kids, be sure to check it out! 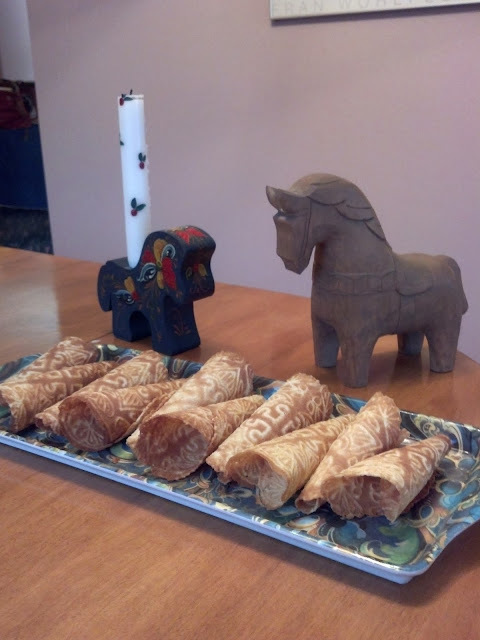 KJ shared her awesome recipe last year for kransekake, and is back this year to share a tutorial for how to make the most adorable little Lucias! Hello there! I’m KJ and I live in Toronto, Canada. I have been blogging as a hobby for a few years. I like to post about the crafty messes that we make at let’s go fly a kite. For the past few years, I have joined Pickled Herring’s Scandinavian Christmas. My paternal side is Norwegian and I like to include Scandinavian traditions in our family’s Christmas celebrations. In November, my daughters and I attended a St. Lucia pageant at Toronto’s annual Swedish Christmas Festival. They wanted to add to their miniature St. Lucia doll collection, so that was the impetus for this project which uses recycled wine corks. Hands: two 6 mm wood beads. The figure’s construction is based on a traditional wine cork angel. Paint the cork white. Hot glue the wooden bead to the cork, but offset the bead slightly so that the bead’s hole becomes the mouth. Next add the crown. 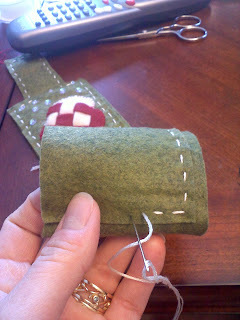 Cut a piece of green to the desired size and cut the candle trim to the desired size. This is a little fidgety to assemble, but if you use wired trim or pipe cleaner it should work. I glued the candles first and then the added the green trim. Next, glue the sash, thumbtack and beads. The yellow bead is glued to the thumbtack’s sharp point. 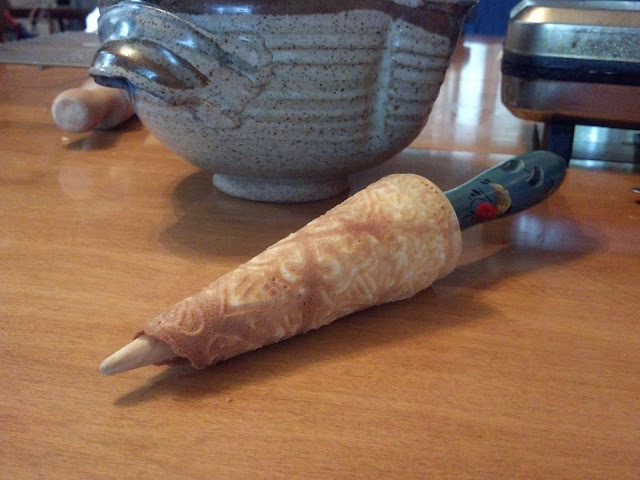 I added a wooden button to the base of the cork, but this is optional. Sketch on the placement of the eyes in pencil first then go over with a permanent marker. I also added a gold trim loop to my dolls to hang on the tree or to place on a bottle of Glögg! Thanks so much for visiting Scandinavian Christmas today, God Jul! I absolutely love these little guys and can't wait to make my own set! Thank you, KJ for sharing such a fun tutorial! Tomorrow we will hear from my dear sister, Caryn! Welcome back! Day 6 is already here and today we will be hearing from a brand new guest blogger today, Nancy! Nancy is a member of the Norwegian Ladies Chorus of Seattle (check their fb page!). Not only does she sing, but she plays the ukelele in a music group that plays Scandinavian dance music! The group consists of Nancy, her mom (91!) on the accordian, 2 vioinists and a flutist. This is Nancy's first year participating in the Scandinavian Christmas series and I'm so thrilled she can join us! Mix well and let rest in refrigerator for 30 minutes. 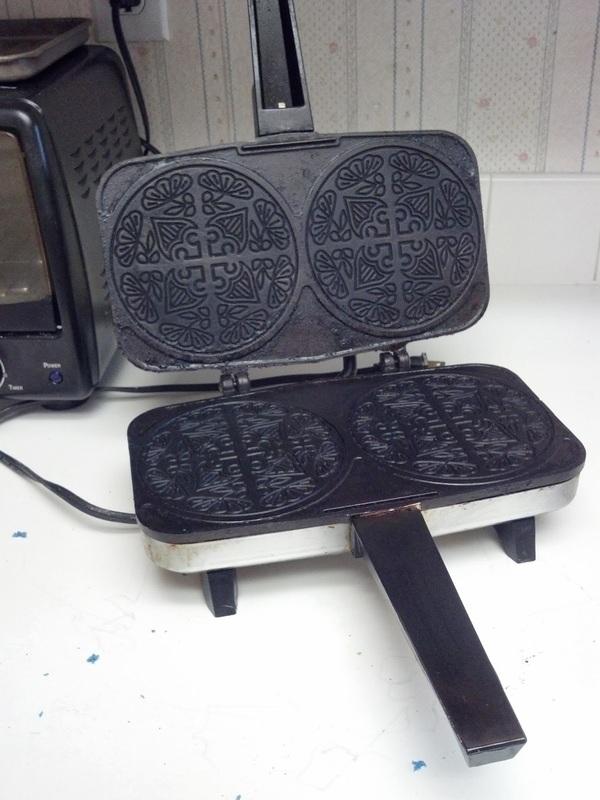 After pre-heating iron, spray well with Pam. Drop one rounded teaspoon onto each side; cook 20-25 seconds until slightly browned. 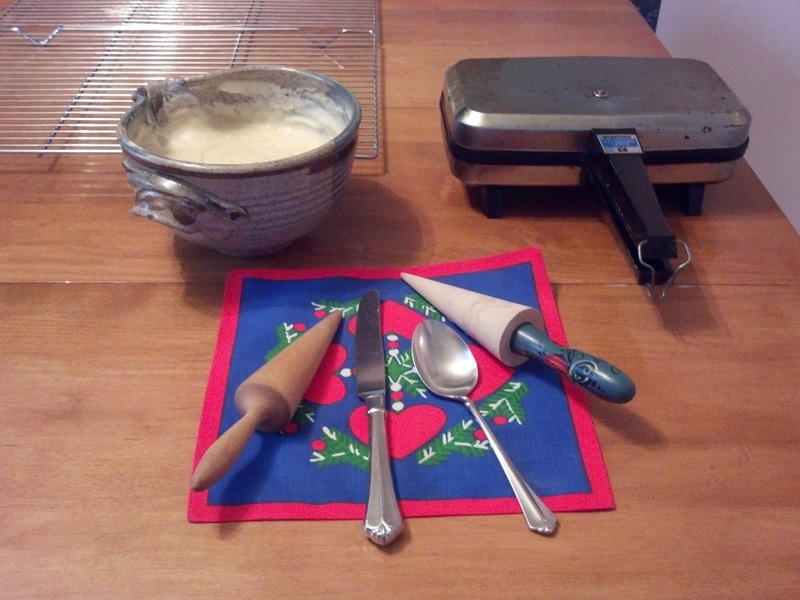 Working quickly, slide off burner with a knife and roll into cone shape. My husband helps me roll the krumkake, and my dog, Kobe, hopes for a crumb or two. Once cooled, store in a large tin. 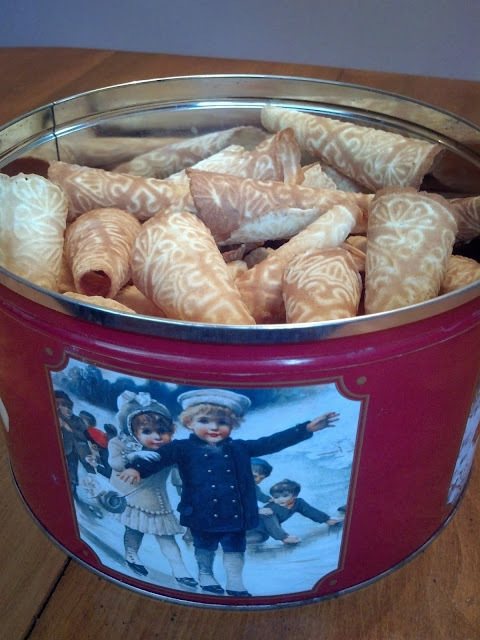 The krumkake must be kept in an airtight container for storage or they will soften. This is usually not a problem if bringing to a party; they will go fast! 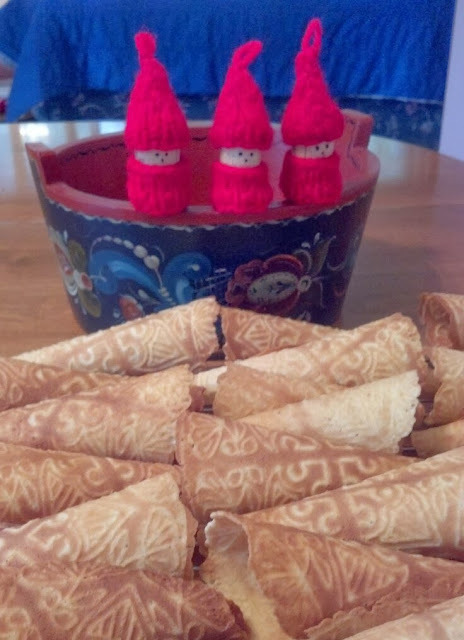 Huge thanks to Nancy for sharing one of my favorite Scandinavian treats! Stop by tomorrow for a seriously cute craft tutorial from KJ! Today on Day 5 we're welcoming back Erica! Erica is married to my cousin Sten and they just welcomed a sweet baby girl to their family! I love following Erica's blog and getting a window into how she adds Scandinavian flair to her holidays and daily life - she is so creative! She shared her delicious almond cookies last year, and rosettes the year before. I'm thrilled she's back for a third year and will be sharing some scrumptious Swedish meatballs! 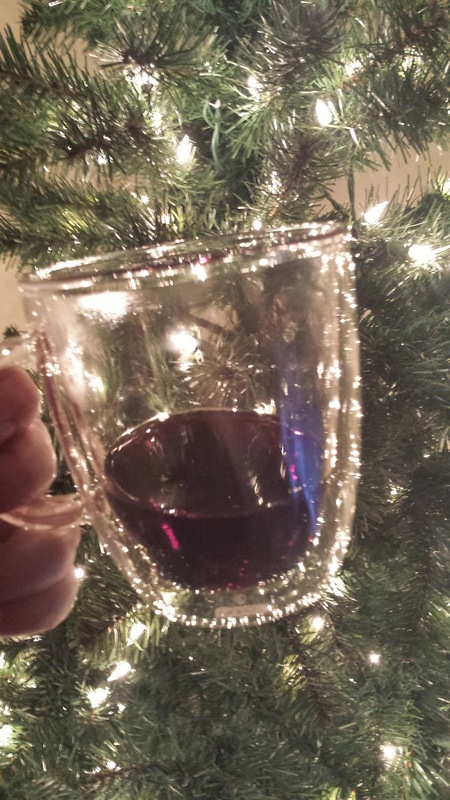 I'm so excited to be a guest blogger for Scandinavian Christmas 2013! 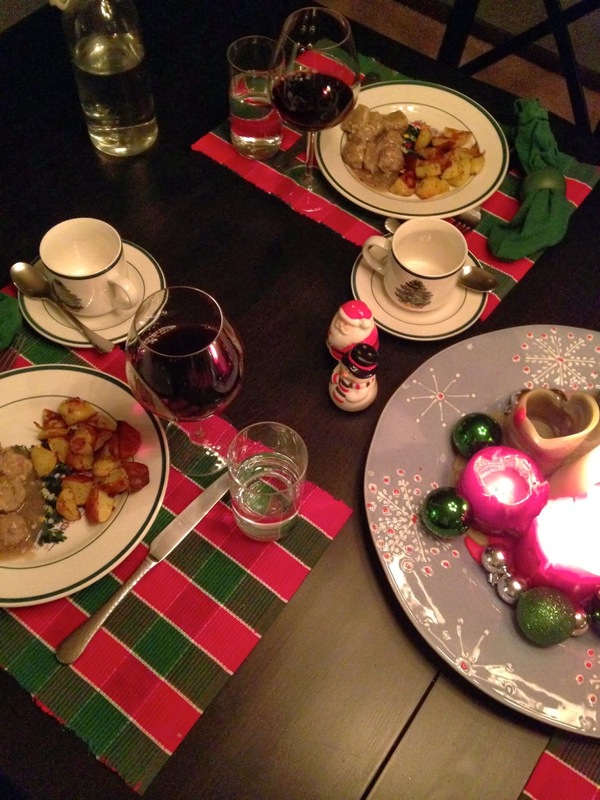 I couldn't decide what to share this year, until I took a look at my Advent Calendar and today was: Make a Swedish Meatball Dinner. Perfect. 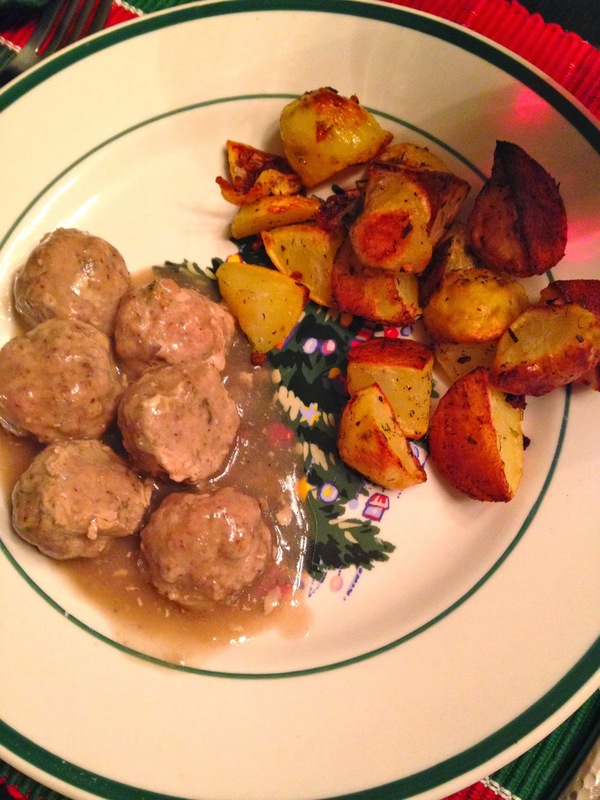 Swedish Meatballs can be enjoyed at anytime of the year, however, on this cold snowy day in Wisconsin with the Christmas lights lit, I feel it screams Christmas! I have a 3 month old (Lucy), so I needed a recipe I could prep while she was napping and this is a perfect "make ahead" meal. 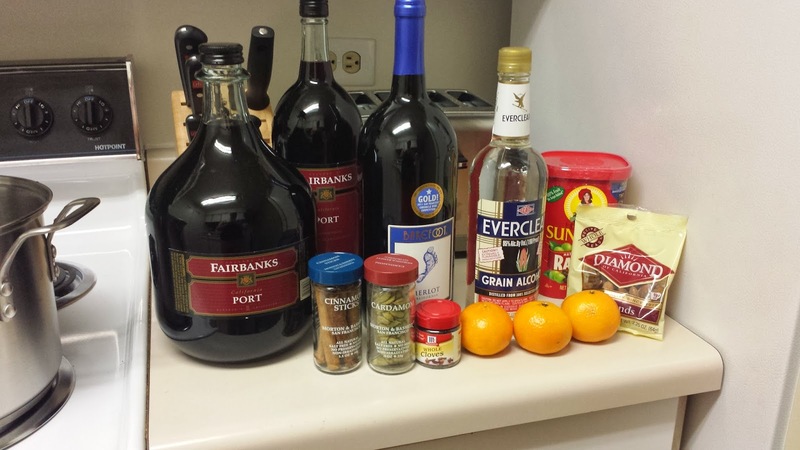 I adapted a few different recipes to make my own based on what I had on hand. Sten and I enjoyed this after Lucy went to sleep. I hope you'll enjoy this meal as well! Combine all meatball ingredients together in a bowl, mix thoroughly by hand being careful not to over-mix. Using a Tablespoon make 24-27 meatballs and place evenly spaced on a greased cookie sheet. Cook at 350 for 18-20 minutes. Combine lingonberries, broth and milk in a saucepan. 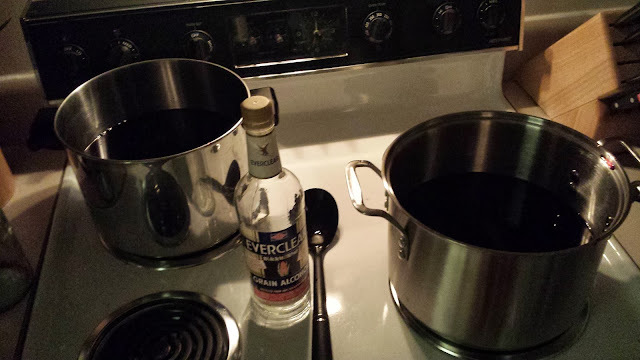 Bring the liquid mixture to a simmer. Combine the cornstarch with the 4 tablespoons cold water. Whisk the cornstarch mixture into the sauce mixture while it is simmering. It will begin to thicken after adding the cornstarch. Continue to simmer until sauce is a gravy-like consistency. Combine ingredients and roast at 450 for 40 mins. 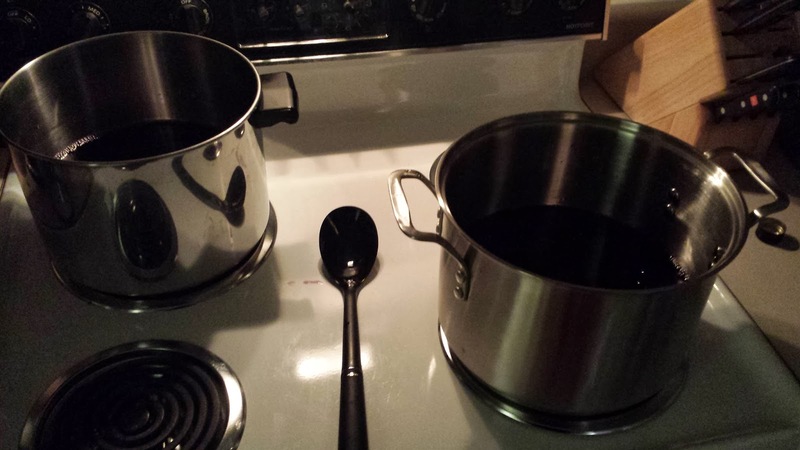 If you too are in need of a "make ahead meal" follow these instructions: after I cooked the meatballs and added them to the gravy, I stuck the saucepan in the fridge. I prepped the potatoes so I could just throw them on the baking sheet and in the oven prior to eating while the meatballs and gravy were warming back up. This meal was delicious and nutritious. Sten said to me: they taste like Tre Kronor- our favorite Swedish restaurant in Chicago! So glad it showed up on my Advent calendar so I could share it! I hope you can cozy up with someone you love dearly and enjoy this warm comfort meal. God Jul from my family to yours! Huge thanks to Erica for participating again and come back tomorrow to hear from Nancy!